Here is the process I use when designing logos, some helpful tips for clients, and the general methodology behind creating a lasting logo. A logo design is personal. It speaks volumes– in one single, impactful design– to help you get connected to those who matter most for your business. For that reason, many clients can feel restless on the logo design journey. All their hopes and dreams seemed to be contained in this one… single… design. That’s a lot of pressure– right? The great news is this. The more relaxed we are with the process and the more fun we have with it, the more audiences sense that in the logo design (and interpret it in your business!). Let’s relate it to a scientific study which showed if you speak beautiful, sweet and supportive words to a plant it grows and grows! But if you speak angrily to a plant, and say hateful, anxiety-provoking statements… it withers. The same is true for relationships… and yes, your logo design! So that being said, below are 3 top areas that will help us support (and grow!) your beautiful new logo design. Together, if we commit to these areas and make them our focus throughout the Logo Design Journey (because it truly is one– a fun one!) we can make magic. When I attended art school, we were fundamentally taught to work General To Specific. Admittedly in the beginning of my design business, I neglected this (very sage) piece of advice, believing I needed to create the PERFECT logo the FIRST time around for clients. But I began to notice it was taking 50+ hours to develop this single logo, and then after sharing it with the client having to– yet again spend another 50+ hours editing or developing the logo design with the new changes. It wasted both my client’s time as well as my own. We would all become frustrated and stressed over the process– and it took the fun out of it entirely! So I decided to create the way my art professors suggested, and allow the process to naturally unfold with a Firm Foundation. Below you will find the 4-step logo design process I use for logo design client. Used to start a dialogue, this step seems ‘sketchy’ to many (hah!) because it seems rushed, unfinished, and as if not a lot of thought went into the designs. Some of this is true! It is rushed and unfinished. This stage is about getting as many ideas on paper as possible. It is opening up and getting it out, even if the designs are bad. Typically, I brainstorm up to 50 rough sketches before selecting the top 3 concepts that are most exciting and relevant to a client’s business. Clients see the top 3 picks and select their favorite to go on to be cleaned up on the computer. Doing this saves time and energy for both client and artist down the line. Because I didn’t spend too much time developing the design yet, clients can easily make bigger changes and new sketches can be drawn up, or we can move right into the computerized logo design stage. In this stage, the previously selected sketch is realized on the computer and given any changes the client wants. It is still an unfinished design that appears sketchy (*general to specific) but lines are smoother, and typefaces (fonts) are often identified at this stage. Revisions can range in amount from 1 to 5, based on the changes desired and the inspiration that hits! At this stage I breath a little more life into the design the client has chosen. I begin creating their logo in Adobe programs and giving it the sleek shape most people imagine logos to be (I say this because some clients LOVE the artsy/sketchy look for their logos). The sketchy lines become smoother (but not ‘perfect’ because that’s a waste of time to do so! Remember– General to Specific) and I may even add a little dose of color to give clients an idea of where I’d like to add some. Then I send the revision to them for a review and hear changes. Typically, this is the stage clients become the most antsy at! They see their logo starting to take form and all of a sudden they may have new ideas (which are great!!) or they may start to second guess their original idea and get anxious about the outcome (which is unfortunate…). Sometimes trusting the process is hard. Clients are undoubtedly feeling rushed getting their ‘baby’ (their business) out into the world, or having their re-branding announced. I totally understand this, as I have gone through the same process with my own business. Just as my client’s ‘babies’ are theirs, my own business of helping create marketing materials and help yours do well… is mine!! The unfortunate thing is this… as much as I love your business and want to support it… it can’t be my baby! I didn’t give birth to the idea, I didn’t breath life into it… I can only be a cheerleader on the side who also helps lift it off the ground! I’m a schoolteacher to your baby– a guiding hand. So while client’s may have the one baby, I have multiple clients… so expecting me to have 12 babies at once is very difficult (babies are a lot of work!). I say this not to discourage clients from the process, but to empower them. Often times clients expect a logo design fast, or the process to be as I used to do it: A PERFECT LOGO FIRST GO. But I have learned throughout designing logo designs for over 10years that this is an unreal expectation. Because I didn’t give birth to your baby (business), I’m learning more about your business and tastes the more we work on a revision. Trust me– I would love to be proficient in mind-reading, or have the power to just know your business from the ground up– in one blink! But alas… I am but one woman… and I have but many clients! Please know that I am trying on these skills though– regardless of if they are realistic or not. I’ve developed the Design project Questionairre to help the process go faster and me understand your business more. And they more information clients supply in that, the more I can understand and create a relevant design for your business. So if you leave the questions “what designs have you seen that you love” blank, or even “what designs have you seen that you dislike” blank… I am not going to have an inkling of your taste level! I’m a visual learner (that’s why I’m so good at creating visual art and marketing). 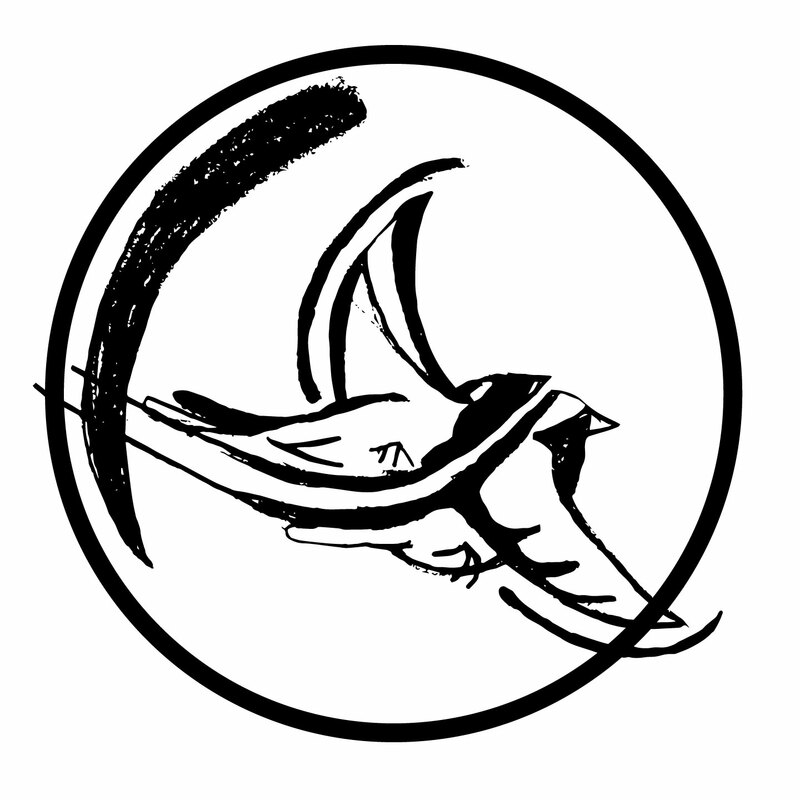 At this stage, Two Sparrows received a computerized version of their favorite sketch. They decided to try a new composition so another sketch was created and developed on the computer. Through a few more notes from the clients, I rotated the wings of the birds, removed the eyes (to lessen the realism), and encased the logo in a circle. At this stage, I created a new sketch based on the client’s notes to narrow in on a composition for Locale and developed it on the computer. I added color to give an idea as to where we may add some down the line. At this stage a new sketch was created based on the favorite compsosition of the initial sketches. It was then realized on the computer and I added color to suggest where we may add some in the future. More revisions are often needed to fine tune the design. Typically, by the 3rd revision we add color and experiment where to place it. I prefer to use colors that suggest more meaning to a design. At this stage, a live computer meeting (one where I can share my computer screen with clients) is set up and in real time I can select the exact color clients desire and they can make quick changes. So this is it. This is a Journey. And I’ve seen clients go through the journey with me with flying colors and we make beautiful designs together– after 4 revisions. I’ve also seen clients get too impatient, feel so rushed and anxious about their new business that they abort the mission after just 1 revision. It’s sad because I really enjoy the journey and I have fun with the process. Which brings me to another piece of advice for my clients…. At this stage, small tweaks were made to the logo (including making one of the bird’s heads rounded, playing with gradients, removing feet, and introducing colors. At this stage, Locale requested a new composition and focus on text rather than symbol. The “O’ suggests the learning and ‘new beginnings’ aspect of the business, as it looks like a sun rising over the (mountain) book. After receiving revision notes and setting up a timeline for the changes to be made to the logo, the client changed their mind and discontinued their logo design journey. Client Receives Official Logo Files! This stage often feels like Christmas! Clients receive their official logo design files, which include file types such as PDFs, AIs, JPEGS, and PNGs. I include a file list with information on where each file is best suited for (such as print projects, on the web, large signs, etc). If your logo was initially a horizontal logo, I also include square logo design files in case a project needs a different set-up. I make sure my clients have the files they need for any occasion. In the past, I worked in the Promotional products industry (think printing on mouse pads, shirts, water bottles, cups, and more) which gave me a lot of expertise in the correct files and/or set-ups that are required for the best print. So if you want to print shirts with your logo on it, and even use in digital marketing I have you covered! Clients are sent various file types and variations in color to support many kinds of online and print projects. These include JPEGs, PDFs, AIs, PNGs and any other kinds the client may need. The client receives various file types and variations in appearance/color to fit any print or online promotions. I also give my clients versions of their logo designs that both include and exclude a slogan, as well as a third line of text (often used to describe their business further). 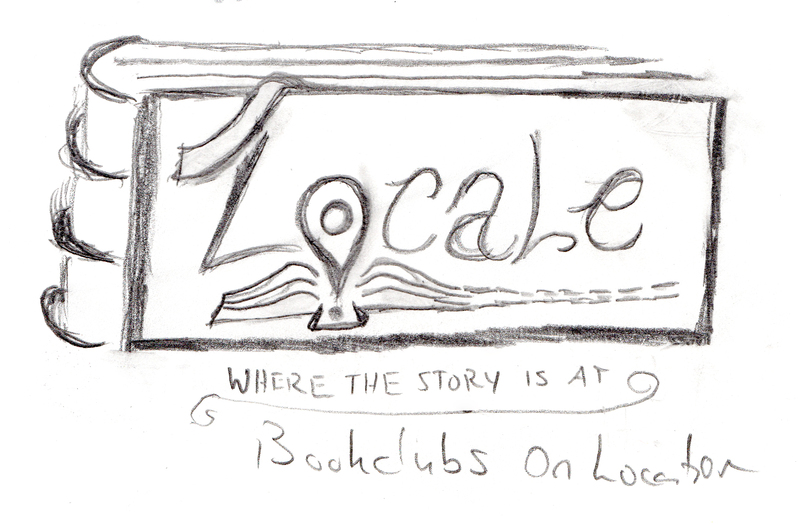 Locale chose to have a version of their logo with the words ‘Book Clubs’ as well as without. I’m a creative ‘professional’. I put professional in quotations because, although maybe I’m considered young, I’ve lived through what you can call an ‘extended near-death experience’ which gavce me the wise perspective of: Life is short and is to be enjoyed. Trying to seperate business from personal life has it’s advantages in life, and if we didn’t have these boundaries their would be no structure and getting necessary work done would be hard. But instead of seeing me as a ‘professional’ I much prefer being seen as the Creative aspect. While I am diplomatic, I am highly considerate of my clients… I love to get to know them (you!) on a personal level. Knowing what is going on in your life, how you are feeling about your new or existing business and where it’s headed, and even your fears/concerns about the process is incredibly helpful! Not only does it help deepen friendships hearing this open communication, it also helps me understand how you are feeling or might be feeling about the Logo Design Journey. And since I’ve been through the Logo Design Journey many times– I can most likely help calm nerves, or redirect our focus if it needs redirected.